Sumac tree is one of the best-endowed gifts by North America to Europe and English styled gardens. Beautiful and tough Sumac tree those un-celebrated garden trees which are small and grow as tall as 30 feet. Sumacs look like handcrafted beauties, which comprises of compound leaves that are a typical lookalike of fern, and they make a perfect landscape accent. You can keep Sumac tree as lovely courtyard sumac tree in your European and English gardens. Few of the most famous Sumacs that you can choose from are- staghorn, winged sumac, smooth sumac or the Tiger Eye sumac which is known for its gold leaf and are categorized under the specially-bred types. Grow Exotic-Looking Sumacs In Your Garden For Beautification. You would be happy to know that garden-enthusiasts across the globe are growing Sumacs in their garden to adorn them. 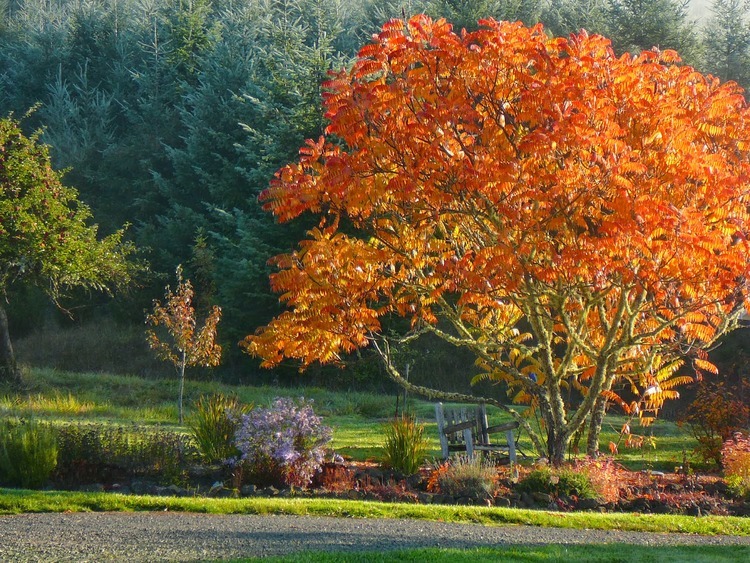 What makes sumacs one of the most preferred decorative sumac trees amongst gardeners are its brilliant fall color. On searching, you would come to know that there are many sumac tree whose leaves turn blood-red during fall, but you would also come across other sumac varieties in orange and yellow for gardens. Wish to turn your garden into a drool-worthy fall show? Well, you can then opt for deciduous sumac tree over the evergreen varieties. You can grow this versatile plant almost on any kind of soil sans a pinch of worry, but make sure you have drained your soil, well. Prefer partial shade or full sun for most of the sumac varieties. 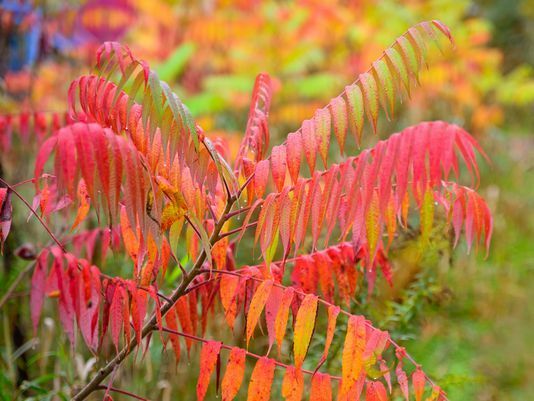 When considering sumac varieties, remember prairie sumac and flame leaf sumac birth better and more flowers and produce beautiful fall color if you can grow them under the full sun. Sumacs are mostly drought-resistant, but they do grow tall if you irrigate them on a regular basis without rain. The hardiness would depend on the variety of the sumac that you have bought. Let your Staghorn sumac have its share of its superstar stardom, as it burns orange and bright red in your landscape while you sit back and enjoys the spectacular show. Sumac species comprises of ample varieties and species that you can choose from your landscape decoration. One such species that beautify your landscape and is one of the most preferred sumac varieties is- Staghorn sumac. Staghorn sumacs are natives of New England but are seen almost in every state’s garden across the country. Not only do they grow quickly but also establish themselves real quick and in proper conditions, can spread into thickets all throughout the root systems. Botanical Name– Rhus typhina and other species. While you might wish to water it post planting it, you would be happy to know that staghorn sumacs are sustainable to dry-areas and conditions. This particular variety of sumac grows as high as 20 feet and wide. What Are Its Tolerances And Benefits? Staghorn sumacs are quite susceptible to poor condition soils and can grow up with a little amount of water, facing and withstanding high-velocity winds. Sumacs are also tolerant to pests and provide habitat and food for the wildlife. The vibrant color of fall and the exotic summer flowers is what lends it a striking feature. The gorgeous red berries followed by the antler-shaped bare branches are an add-on to your winter accents. 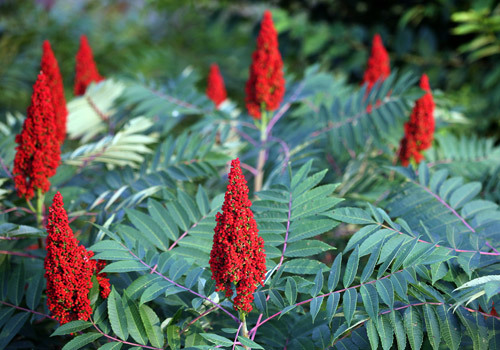 You can plant staghorn sumac any given time between last frost and six weeks prior the first frost. If you plant staghorn sumacs during fall, you would hardly be required to water it. Why Staghorn Sumac tree For Landscape Beautification? Staghorn sumacs have elongated compound leaves that lends them a beautiful tropical accent, and they bloom during the midsummers with panicles that are greenish-yellow and are about 4-8 inch long. The full-grown staghorn sumacs have shapes of an umbrella and are prone to colonize real fast through bird spreading seeds and suckering. Staghorn sumacs are generally preferred for their fierce and vivid fall color and red seed clusters. Sumacs offer some of the vibrant reds and bright oranges in the autumn landscapes. How To Use The Sumac? You would always fall for the tropical accent and bare trunks of the foliage. The Sumac tree grows quickly and is said to spread like a wildfire, specifically in its habitat of East Coast. You can grow sumacs in mountain forest ecosystem, grasslands, deserts and riparian ecosystems as well. The berries and the amazing fall foliage is what makes it outstandingly pretty. Staghorn sumacs have better-detailed leaves and an oblong form that gets 6-feet long and wide. Tiger eye sumacs, as you might be aware of, lends a vivid color to your garden with its detailed leaves and a charming tropical look. Low-grow sumacs and prostrate sumacs make awesome ground covers. The cut leaf sumacs are blessed with colorful and intricate foliage and they fill up the thickets. Staghorn Sumacs can dominate your yard if you do not pay attention. It is thus advisable to plan the sumac tree with the expectation of having one design Sumac tree. The root systems spread fast, so always make sure to dig a hole that is some 3-4 times bigger than the root ball size and has the equal depth of the root ball. Shake the root ball out and loosen it up. Gently place the Sumac tree inside the hole and fill it halfway with soil. The remaining portion of the soil can be filled with water and you can leave it to drain before adding soil to it. 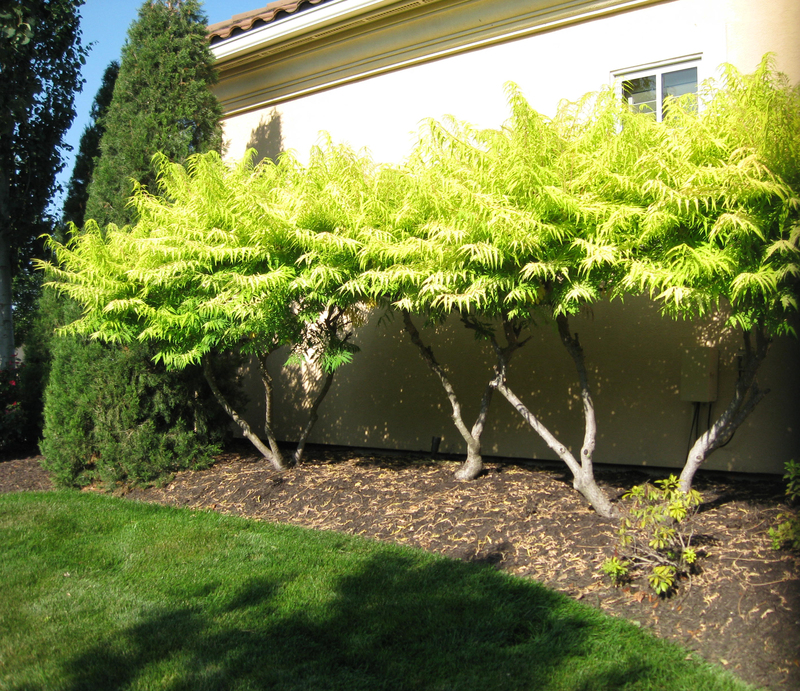 Spread 3 inches of mulch on the top but restrict it from touching the trunk of the Sumac tree. If you are planting the sumac during summers or during dry conditions, ensure that the Sumac tree is properly watered and also make sure you don’t overwater it. To avoid the Sumac tree from spreading, prune the suckers that arise from the base. One of the prettiest fall foliage spectacles, Sumac tree are truly majestic and are just about the perfect ornament needed for your garden.